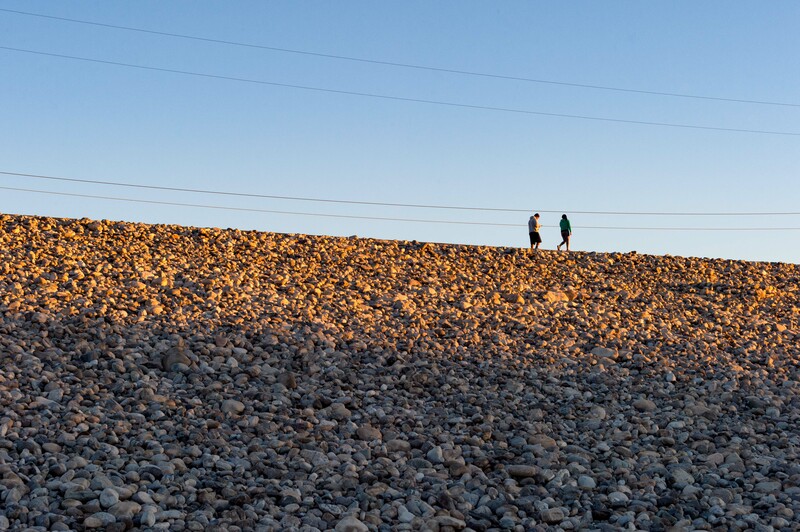 Walkers on the path atop the Santa Fe Dam in Irwindale. Photo by Steve Hymon/Metro. The government’s new support includes a request in President Obama’s proposed budget for the next fiscal year for $4 billion, to be spent over 10 years, to finance research projects and infrastructure improvements tied to driverless cars. Mr. Foxx said that autonomous vehicles had the potential to reduce traffic accidents and significantly improve safety on America’s roads. He estimated that as many as 25,000 deaths could have been avoided last year if driverless technology had been in widespread use. Interesting given a lot of the chatter in transpo world about whether self-driving cars will compete with transit. In related news, the NYT also has a story headlined “Automakers go electric even if gas is cheap.” The crux of it: more electric cars are about to hit the market in America, where automakers need to increase their average fuel economy in 2017, the first step in getting to a 54.5 average mpg in 2025. The challenge: cheap gas in recent months has inspired a new wave of SUV and truck sales, the reason that the average fuel economy of new vehicles purchased in December slipped below 25 mpg — the first time that happened in 2025. In other words, we’re going backwards at a time when both U.S. law and the climate change suggests we should be putting the pedal to the metal (okay, hypermiling) into the future. The city of L.A. is trying to find a way to complete the .7-mile gap in Cheviot Hills for the bike path that will run parallel/near the Expo Line extension to Santa Monica. No decisions have been made but two options involve protected bike lanes on or along Northvale Road (which runs parallel to the train tracks) and the other option (and the most expensive) would put the bike path in the Northvale trench adjacent to the train tracks. As Joe Linton writes, there are obstacles to getting this done: the project isn’t cheap, isn’t yet funded and buying easements from homeowners may be needed for part of the bike path. Stay tuned. The Sikh Coalition is seeking to have an attack on a Metro bus operator who is seek investigated as a hate crime, reports the LAT. The Los Angeles Sheriff’s Department is investigating the accident and Metro officials point to ways they are trying to do more to protect bus operators given a rise in attack — including installing protective barriers on buses. Otherwise, the agency declined comment on this particular attack because of pending litigation against the agency. Streetsblog LA editor/founder Damien Newton interviews Glendale Mayor and Metro Board Member Ara Najarian, who talks about the March 5 opening of the Gold Line extension to Azusa, Measure R and Metro’s potential ballot measure to raise funds for new projects. Related: speaking of the potential ballot measure [PBM], the group MoveLA last month posted their proposal in late December for how funds should be distributed. Metro is scheduled to release their funding list for the PBM in March. Here’s the latest Metro staff report on the PBM and how it’s taking shape. Shocker — sharrows are those bike icons that cities stick in the middle of a lane to show the supposed best place for cyclists to ride on roads lacking bike lanes or adequate space for cyclists. As HWR has noted for some time, sharrows are what you do when you want to make it look like you’re doing something but actually doing nothing. Very early talk about a light rail project to connect the Strip, DTLV and the airport. Officials suggest that passenger fares can help pay for it, which attentive Source readers know is an unusual stance in American transit — with most systems heavily subsidized. Jan. 14: A look at Mayor Eric Garcetti and Los Angeles’ attempt to do something about traffic and more on the Rams move to the Coliseum and then Inglewood. Jan. 13: The Rams aren’t here yet but concerns over game day traffic are. Plus concerns over getting to the APU/Citrus College Station in Azusa. Looks like it might be more feasible, and a whole lot cheaper, to have bicyclists to take an alternate route to close that gap in the Expo path. They could just see about putting in a bike lane on National Place all the way until it turns into Westwood, going north toward the station. I assume the bike path resumes there? Whatever happens, at least there’s Google Maps. Having driven on roads with sharrows, I can say they’re at least useful in signaling to the driver that bicyclists don’t have their own lane, and may enter the road. Cyclists are still much less visible than cars, though, so I couldn’t say if there’s any measurable safety improvement – especially when there are impatient or distracted drivers. Self-driving cars and electric cars are lovely (I have an electric car)… but they don’t do anything for congestion. They’re caught in traffic just like everyone else. So they’re no substitute for passenger rail, and they’re no substitute for bus lanes. How do you know with absolute 100% never-wrong certainty that self driving cars won’t make streets less congested by encouraging more rideshare services that reduces the amount of privately owned cars on the road? You’re making hypothetical assumptions based on something that doesn’t exist or implemented massively in the marketplace yet, let alone not even a single traffic or study done about it because at this time, it’s all hypothetical. As for passenger rail or buses, it’s never about substitutes, it’s about more choices and more methods. You’re never going to get people off the road, you stated yourself that you own an electric car, meaning that you yourself aren’t taking the train or the bus 100%. I don’t understand why people are betting that self-driving cars will help promote ride-sharing services. I for one would be less inclined to use one of them without a human driver behind the wheel. Everyone is so concerned about the new football stadium in Inglewood. It would have been nice to have been this concerned when the Gold Line was built to put a station closer to Dodger Stadium. I know you run shuttles from Union Station. However, it seems to me at least that some people in the Metro planning department can not see in to the near future very well.. Look at what happened with the connection to LA Airport that should have been done decades earlier than it currently is. Also, as far as electric cars, as long as people live in common buildings such as apartments and condos; it will never happen because it is too expensive to install that type of equipment in to older buildings. Just because someone doesn’t understand doesn’t mean the consumer shouldn’t be given the opportunity to at least give it a try, use it and let the market decide for themselves. People once said that they’re not going to trust a machine with levers and controls to make a carriage go and that they’d rather continue to do it the tried and true method of having horses to do those jobs. Humans make terrible drivers. They text and drive, drink and drive, put on makeup and drive, too much distraction and accidents occur by not paying attention to the road.